I am a stay-at-home mom who learned how to save 75% on my grocery bill, 65% on gifts and love teaching others to do the same. I believe that in order to change your life you must do more than behavior modification, but get to the heart of wastefulness. I am a HUGE fan of Dave Ramsey. My family went through a time in 2009 where we were paying 2 mortgages on 1 income. God definitely provided. I am using this blog to help others, hold me accountable and give myself a hobby in the meantime. New Website!!! Change your favorites! If you're reading this, it's likely that you're accessing my website through your favorites. The Centsable Lady has moved blog services and will no longer be posting via the blogger interface. 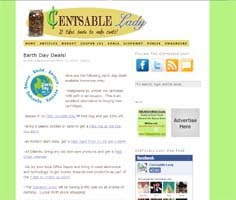 Please make sure you access our NEW website via centsablelady.com. Don't want to miss a deal? Subscribe via Email or RSS feed to have free samples, coupons and deals sent directly to you. Click here to refer your friends to our site. Thank you so much for being so faithful. My husband and I went on vacation with the kiddos. I have tons of new creative ideas for FRESH articles. Also, I am moving my blog from blogger to wordpress. I will see you after vacation with our new look. I LOVE FREE offers like this one! CVS is offering 50 FREE prints and FREE photo storage for signing up for their photo center. Do you love to have designer clothes and home goods , but hate to pay designer prices? I found this great company, Haute Couture where you can receive special access to members only sales! Sign up for Haute Couture for free and receive access to amazing savings opportunities! Dave Ramsey and Written budget! Let this month be the month that you make a change. GET A BUDGET! If you are overwhelmed, sign up for Financial Peace University, pick up one of Dave Ramsey's books at the library or buy a book here . FRIENDLY REMINDER: Print your Coupons and BUDGET!!! At the beginning of each month, the following websites reset their coupons. That means you can go ahead and print the coupons from this month that you will need next month (to the print limit). Plus, it is time to set up your Zero-based budget (then negotiate with your spouse) for April! If you are single, put together your Zero-based budget and get an accountability partner. No excuses! What is a zero-based budget? A zero-based budget is one where your total income minus your total expenses equals $0. In other words, it forces you to assign every dollar of income to an expense (or savings) category. As Dave Ramsey puts it, you’ll be “spending your month’s income on paper” before you spend it in real life. But my husband handles the finances! My husband had a ton on his plate. I asked him if it would be okay if I, the unorganized spender, could do the budget. With a smile, he said yes. HELP him by helping your family make a budget. Yes, numbers make my head hurt too. Isn't the word budget a four letter word? No, I love my budget. I have FREEDOM like you will never believe with a BUDGET! Overwhelmed? Sign up for Financial Peace University or buy Dave Ramsey's books ! directly to you. Click here to refer your friends to our site. LAST DAY: FREE photobook with Picaboo! Michael's 50% off one item coupon! With Easter right around the corner and Spring craft projects getting ready to start, be sure to use this GREAT Michael's 50% off one item purchase coupon! Take 80% Off $25 Gift Certificates and Pay $2! Just use Promotional code COOK!! I HIGHLY recommend to stock up on the Gift Certificates when they are 80% off. They do not expire for a year after purchasing one so you will have plenty of time to use it! Or even better, sign up for the Dinner of the Month Club and get a 12 month package of 12 $25 gift certificates and ONE FREE $50 gift certificate. The total for this package is $120, but after entering promo code: SAVOR - your total will drop down to $24! That means $350 worth of dining for $24! Restaurant.com is a website that sells gift certificates to restaurants all over the country at a DEEPLY discounted price. Go to Restaurant.com and enter your zip code to pull up your favorite restaurants. Choose a restaurant that interests you and add a certificate to your shopping cart. Add code: COOK to save 80% off. Once you complete your order, you will receive a link to your gift certificate. Use certificate at your favorite restaurant when you order. Dyson DC24 Upright Ball Blueprint Vacuum 50% OFF! Right now, Buy.com is selling the Dyson Upright Ball Blueprint Vacuum (Limited Edition) for $299 (regularly $599). That is almost 50% savings! I just bought a refurbished Dyson (only 6 month warranty) for $250 at Big Lots. This is one of the best deals that I have seen! Go to the link and check out the excellent reviews. Don't want to miss a deal? Subscribe via Email or RSS feed to have free samples, coupons and deals sent directly to you. Click here to refer your friends to our site. FREE 20-page Classic Leather bound photobook! Just pay shipping! Mother's Day and Anniversaries are just around the corner. Through March 31st, you can receive a FREE 20-page Classic photo book from Picaboo using coupon code AFFLGB. Taxes and shipping charges are not included. This coupon is for first-time customers only. TODAY ONLY! FREE JumpStart Software! TODAY ONLY, Costco offers its members JumpStart® 3D 1st & 2nd Grade for $17.99 (non-members pay 90¢). After the purchase, Costco e-mails an online rebate for $17.99, cutting the price to $0. PLUS, there is FREE shipping! Let me know if you snag this FREEBIE!